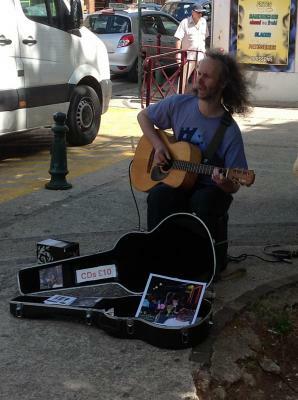 Another day of promotional busking, this time in Clermont l'Herault. Clermont l'Herault has a big market on Wednesdays, and is centrally placed amongst the towns where I will play my gigs over the next few days. An ideal place to spread the word. A little further away but a pleasant drive through the mountains, we arrived about 10:30 or so. Unfortunately the pitch that Pete had recommended was already taken by another guitarist, a familiar feeling from the days when I busked for real, so we had to move further up the market. Still we found I nice place with quite a few cafe terraces overlooking it. Same plan as yesterday, I busked whilst Pete gave out flyers, this time there were no unhelpful Gendarmes, so I could put out the CDs too. Played for about an hour with many people stopping listen, and taking leaflets. A few drops and a couple of CD sales. We stopped once Pete had run out of leaflets as the primary purpose was the advertising not the busking. Just before the end of the session, someone I vaguely recognised came past and stopped to talk to Pete whilst I was still singing, lo and behold once I finished the song he up up to say he'd seen me busking in Fareham in the old days! Small world. Petite Mond!